Also: Rachel Maddow covered Ricketts's continued shenanigans on her show, too. Last week, the Unicameral revoked Pete Ricketts's license to kill when it overrode his veto of the legislature's death penalty repeal. 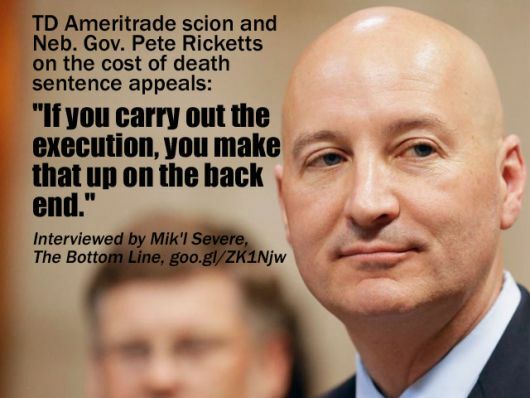 Ricketts's stubbornly arrogant refusal to accept the second of two anti-death-penalty votes is now taking the form of the continuation of his expensive, doomed quest to score illegal execution drugs that the FDA says can't be imported into this country. So he's essentially saying: "Hey guys, great news! I found the murder drugs that I've been looking for! Good News! I found a way to get the murder drugs!" How is that good news, you unpeeled hard-boiled egg with teeth? ...That is pathetic. Because saying that you have access to high-quality drugs from India and then not being able to deliver is embarrasing enough when you're a high school junior trying to get into your prom date's pants. It is downright humiliating when you are the adult governor of a state trying to desperately kill people, you dollar-store Lex Luther." "Their governor, an enormous Human Thumb, Pete Ricketts"
"You unpeeled hard-boiled egg with teeth"